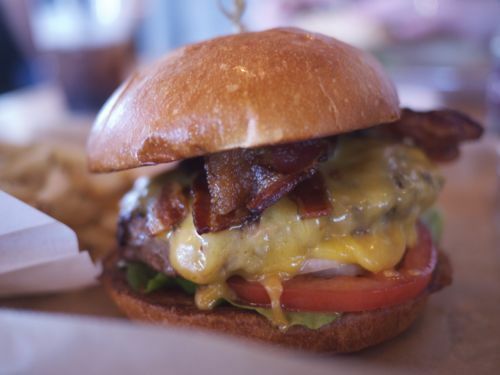 Hopdoddy Burger Bar has a clean, Californian feel to it. Expansive, plenty of wood and steel, liberal use of upper-case Futura labels around the place. It’s also the provider of my favourite Austin burger - no mean feat considering the plentiful and creative competition. As with all burger joints worth their salt, Hopdoddy has a line. It is, however, a carefully engineered and thoughtful line. Firstly, you have no real sense of just how far back the restaurant goes, which lulls you into thinking you’ll maybe get served pretty quick. 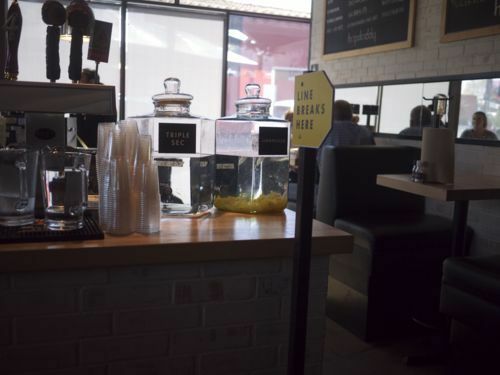 You also immediately notice the huge bar with artfully labelled jars of Limoncello and Triple Sec, and a wide array of local craft brews to choose from. You order drinks at the bar and obtain your food menu there, which is smart because any line is more easily survived with a beverage in hand. A selection of twelve sandwiches are on the menu, with a classic cheeseburger starting at a highly respectable $6.50. 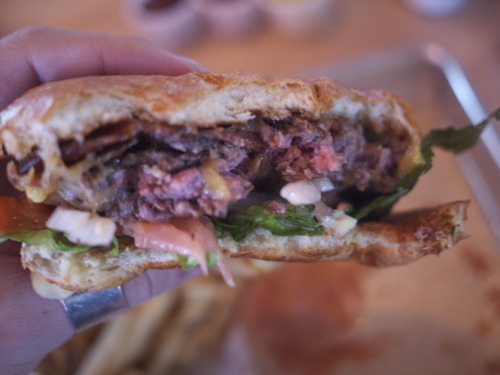 Patties are all Angus beef (their sole reference to the Scottish heritage of their name, but ultimately from Austin), but that means they’ve probably been grass fed. Like other local establishments, they make a fuss about using Kennebec potatoes for their fries. While ordering drinks you also get assigned your table. Up until this point we’d expected there to be the typical bunfight to get a table since the whole thing looks like a buffet. The key difference is your table is saved for you with an order number - once you get to the top of the queue it’s standard waitress service, and your food magically appears about ten minutes later. Really slick. Take note. I went with a classic cheeseburger with bacon - our standard control burger and a side of fries. Mrs D went with the Continental Club - a turkey and provolone club sandwich effectively served in the same brioche as the burger. Now, we agree with the generally accepted ‘if it ain’t broke, don’t fix it’ thinking when it comes to sauces. Heinz ketchup is about as good as it gets, although there may be better American mustards than French’s, it’s the gold standard. We’ve whined before when chefs have thought they could create something from scratch that will be better and they’ve all failed dismally. Until now. 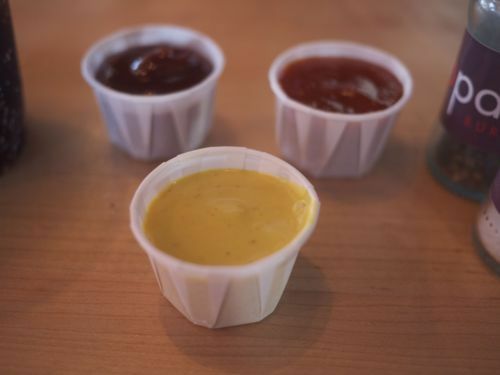 Hopdoddy has a trio of incredible house sauces - a spicy ketchup, a thick mustard and an incredibly deep BBQ sauce. Almost effortlessly good. None of the three break down into an oily pool of grossness when subjected to hot food, succeeding where others have failed. By this point, even if the burger had been average, I would have been really happy with Hopdoddy. The dining room management, ordering experience, excellent bar and attention to detail were already exemplary. 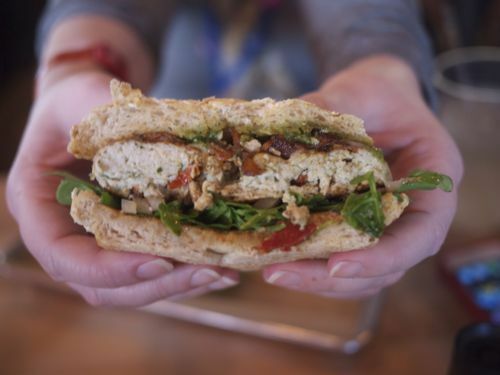 So, to the sandwiches. As a bacon cheeseburger, this was one of the best ever. Straight into the pantheon. Everything is perfectly proportioned, ordered and constructed. 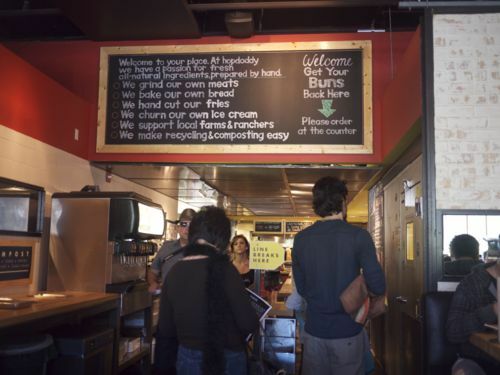 The bun was dreamy. The beef bursting with flavour. The cheese, a real cheddar from Oregon (and you know how much we like our plastic), had melted on cue. The bacon was a crispy revelation. The entire burger was practically faultless, and I’m sad to say it was gone in under two minutes. The fries were fine. We’re not as sold on Kennebec potatoes as much as America wants us to be. The club was good too - the sauces really made it, in particular the fresh pesto. Everything is served with such a sense of wholesome cleanliness, that you could almost be forgiven for thinking the product itself is good for your health. Next time I’m in Austin, this is the very first place I will go. Don’t miss it.